BMW 5 Series Performance, Engine, Ride, Handling | What Car? 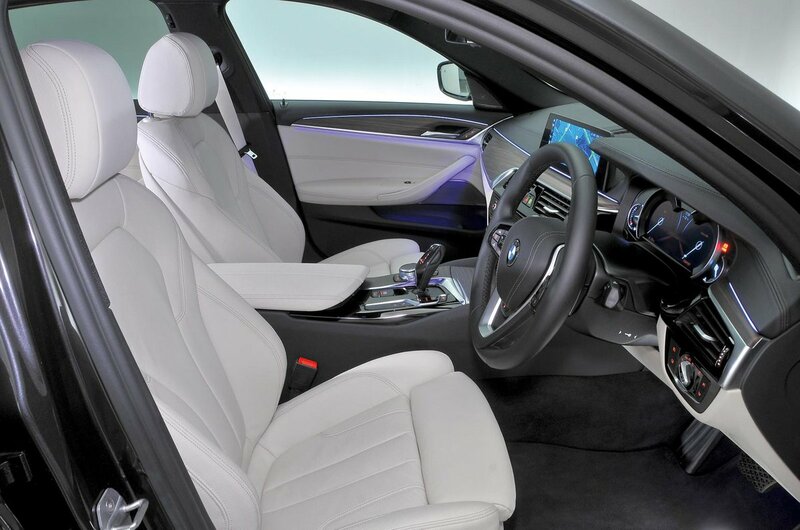 You’re certainly not short of engine options with the 5 Series. Many buyers in this class do big mileages, so diesel tends to be the most cost-effective solution and, while we're yet to try the 518d, the 520d is punchy enough and the most popular choice. It can whisk you up to motorway speeds without fuss and rarely needs working hard. Performance is roughly on a par with the rival Mercedes-Benz E220d's, although in terms of real-world driveability (as opposed to outright 0-62mph acceleration), the Audi A6 40 TDI has a wider performance window and provides more engine flexibility as a result. If you want more grunt, we’d recommend the brawnier six-cylinder 530d; it’s effortlessly quick and, in everyday driving, just as rapid as the more powerful 540i petrol. The 540i is the most powerful 5 Series you can buy – aside from the full-fat M5, that is, which you can read about in our dedicated review by clicking here. The 540i is brilliant to drive quickly, thanks to its scintillating pace when you really extend it, accompanied by a tuneful straight six engine note. The lesser four-cylinder 530i needs plenty of revs to get the best out of it, so it's the least recommendable engine in the line-up. There’s also an entry-level petrol 520i which we’re yet to try. For those living in congested cities, the plug-in hybrid 530e iPerformance is also a tempting proposition. With a 29-mile claimed electric-only range (we managed 18.1 miles), short commutes can be completed without the assistance of the petrol engine, reducing daily fuel bills. However, on longer journeys you tend not to see the benefits of the electric motor once the batteries are depleted. The 530e offers a choice of driving modes that either maximise the electric driving range, hold the battery at a pre-set state of charge, or mix the two, depending on your preference. If, for example, you’re starting your journey on a motorway, it will save the battery if it knows from your sat-nav that you’ll be finishing in the city, where it can make best use of the charge. 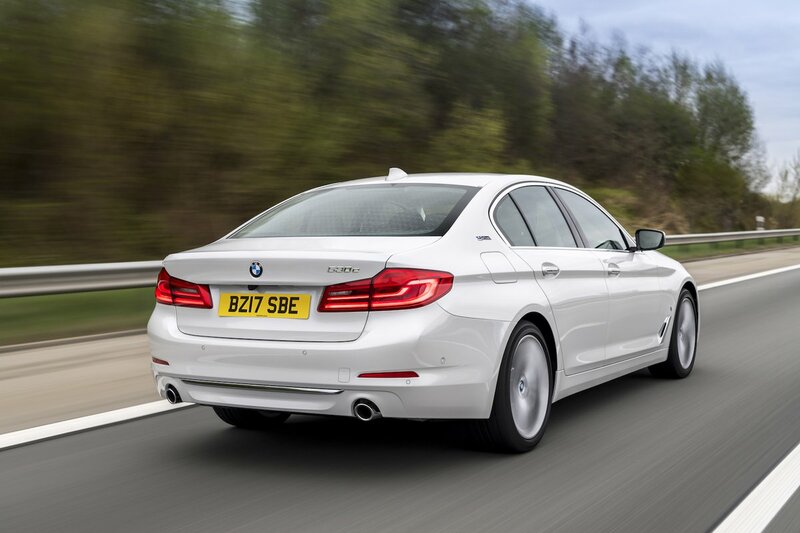 All versions of the 5 Series have an eight-speed automatic gearbox that’s one of the best of its type. It shifts quickly and rarely dithers at junctions and roundabouts, or you can take control yourself via paddle shifters mounted behind the steering wheel. It's better than the slightly jerky A6 40 TDI's dual-clutch automatic 'box, that's for sure. The way the BMW 5 Series rides depends largely on whether you go for the standard suspension, the stiffer M Sport version, or do what we’d suggest is best, which is to tick the box for the reasonably priced optional adaptive Variable Damper Control (VDC) setup. If you do this and don't specify huge wheels or run-flat tyres, the 5 Series rides superbly. On the non-adaptive suspension, the 5 Series is supple enough around town over big bumps, but there’s always an underlying shimmy through the car on anything other than super-smooth roads, particularly if you opt for 19in wheels or the run-flat tyres. If you do lots of motorway miles, you’ll probably find this quite annoying. You’re best keeping to the 17in wheels that come as standard on SE trim. Cars with VDC, though, are even more forgiving at low speeds, and ride in a much more sophisticated fashion along pockmarked British A-roads and motorways, if you press the Comfort button next to the gear selector. In fact, few cars in any price bracket ride so smoothly yet still offer such composure over wavy roads with crests and falls. And here's the good news: that's the case whether you opt for SE or M Sport trim, because the VDC set-up is the same for both. It’s worth noting that the plug-in hybrid 530e iPerformance never rides with quite the same aplomb as its conventionally powered brethren, even on VDC suspension. We suspect this is down to its slightly firmer springs, which are designed to support the extra weight of the batteries and electric motor. Indeed, it can send a judder through the car if you drive over potholes or large ruts in the road if you opt for big wheels. Unlike BMW's traditional strap line, we'll stop short of classing the current 5 Series as 'the ultimate driving machine', but it certainly snaps at the class champions' heels. The steering is its weakest link, because while accurate enough, it’s quite a bit slower than that of rivals such as the A6 and E-Class and, when you press on in bends, not as delicate or informative as the Jaguar XF's. Indeed, it's the Jaguar that we'd rate as the sharpest-handling car of the bunch. 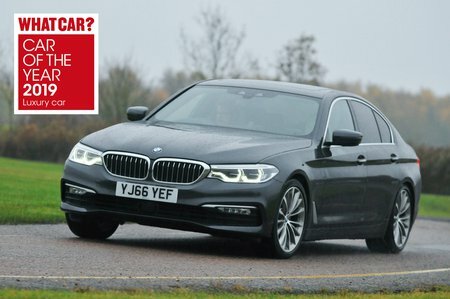 The 5 Series doesn't have quite as much front grip as its key rivals, either, yet drive it at, say, eight-tenths – exploiting its sublime rear-wheel drive balance, rather than leaning so heavily on its front tyres – and there’s still plenty to savour about pedalling the 5 Series down a wide, snaking A-road. Keen drivers should bear in mind that the extra bulk of the 530e’s battery pack and electric motor is felt in the bends. Although it remains predictable and enjoyable at a fairly brisk pace, go faster and you’ll find it less keen to turn in to bends or change direction. It’s certainly more enjoyable than the Volvo S90 T8. If you want to make the 5 Series a bit keener to respond, you should option the Integral Active Steering. This employs the rear wheels to help out with the job of steering, turning them a few degrees in the opposite direction to the fronts at slow speeds for better manoeuvrability and in the same direction at higher speeds to aid stability. As you might imagine, going for the xDrive version (four-wheel drive) improves traction considerably in the wet. The 5 Series does a brilliant job of keeping wind and road noise away from your ears even at really high speeds; it's a car designed very much with German autobahns in mind, after all. For library-quiet cruising manners, though, avoid noisier 19in wheels and run-flat tyres. Beyond that, the noise level depends on which engine you go for. The quietest and smoothest is the 540i petrol, which sounds sweet even when you hoof it. The six-cylinder 530d is still remarkably muted and merely takes on a pleasant growl when you work it hard; you rarely have to, though, because of its prodigious low-end grunt. Meanwhile, the best-selling 520d is quiet and smooth most of the time, but no doubt a little coarser than the rival Audi A6 40 TDI's diesel engine and, in some respects, the E220d's, too. Around town the 530e iPerformance is the quietest car in the line-up, because its electric motor endows it with a level of low-speed refinement that conventionally powered rivals can't hope to match. However, once the batteries are depleted, it’s hard to ignore the rather gruff-sounding 2.0-litre petrol engine, especially if you put your foot down. That's the same story in the 530i as well. All engines come with a superb eight-speed automatic gearbox, which is never anything but ultra-smooth through its gears.